I recently purchased an HDMI to HDMI+Optical and stereo analog output box from Banggood. I was curious at to what was inside as well as the build quality. It's pretty good! This post has photos as well as links to some of the components. The solution is to use an HDMI selector ($10 or so!) and then afterwards place the audio extractor shown above. That way I get surround sound for every device (and I don't need to use the TV passthrough which doesn't really work anyway since it has to be on! ), and I only need one remote control to select what I want to watch / listen to. 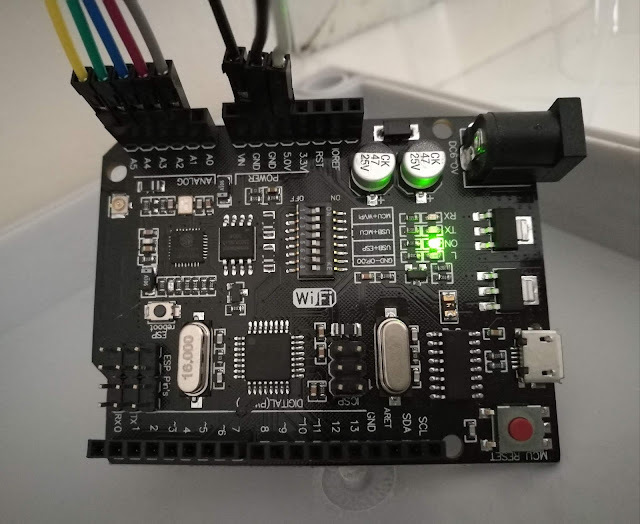 This is really convenient for my home automation system too, since I can use one IR blaster to turn on everything, and simply send the commands to the selector and everything works... The selector actually has an external IR receiver so perhaps I'll make it work without IR :) stay tuned! 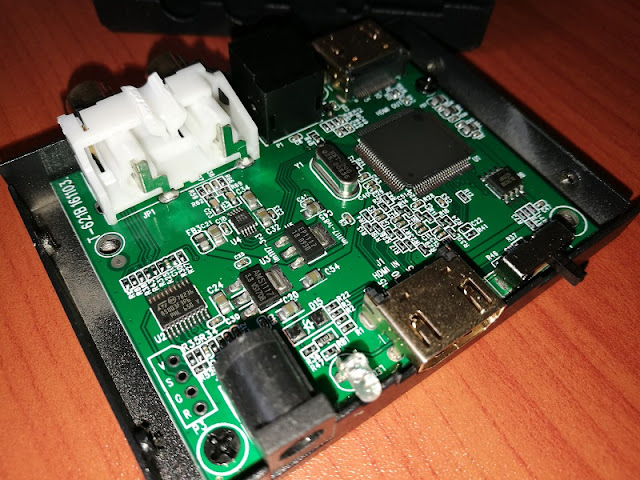 It's a good quality looking PCB without any dodgy soldering and nice looking solder mask / silk screen. What's important it the components though. In terms of power supply, the input is 5V and there is a 3.3V and 1.8V linear regulator immediately visible. Linear regulators have good noise performance compared to switch mode so this bodes well for potential buzzing on the analog audio output. The Analog to Digital Converter (ADC) is the small 8 pin chip close to the RCA outputs. It's a CS4344 from Cirrus Logic. 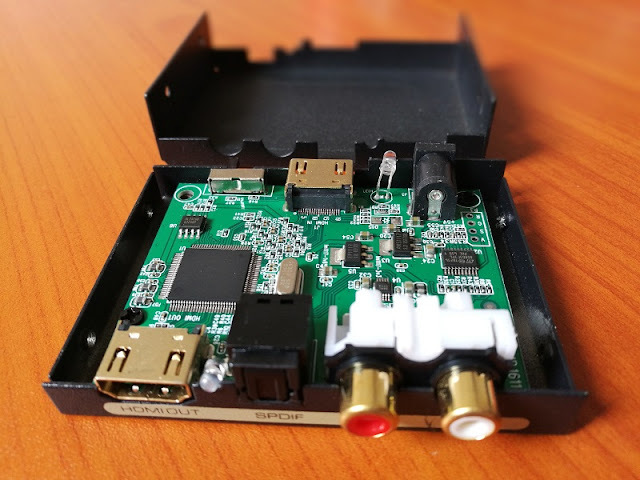 It's a pretty good ADC: 24 bit, 192 kHz stereo (obviously). The THD+N is pretty average at -90 dB which is about 0.003%. This is still a pretty good THD given that most affordable HiFi power amplifiers can only do 0.01% (and sometimes as bad as 0.1%). You'll probably find that your typical power amplifier at home is as bad as 10% THD when you crank it up - so nothing to complain about here! Overall, having used this device for a few weeks now I'm happy with the performance! 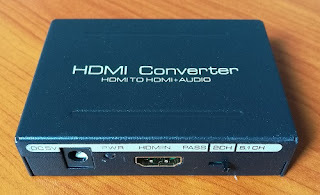 The only issue is that sometimes when I change HDMI source using the selector, this audio extractor doesn't immediately figure out that the source has changed and I need to power-cycle to get the audio back. It's pretty rare so no big deal! One other issue is that my BluRay player seems to know something is up, and it won't work through this device due to the HDMI encryption.